Well, I could be called a gear snob for many of the reasons. What is objective surely lies in the eye of the beholder. My real snobbism these days is more related to the actual performance ability of any product rather then given price tag. 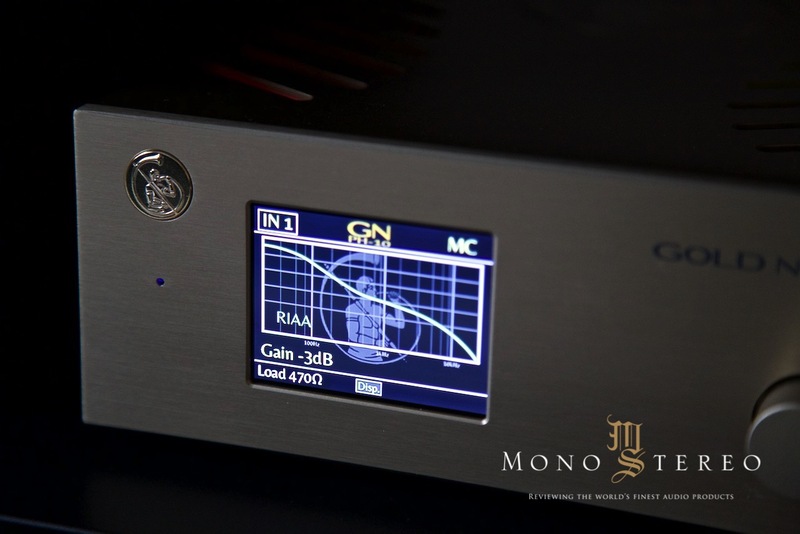 These days, the utmost level of performance and deriving of the last information out of the audio front end is sadly, in most cases reserved for the heavy priced gear. Like it or not, but its the current state of the affairs. I won’t say I’m uber happy about this, but high-end audio became luxury induced and kittened with quite few products, that are not brining exactly what’s expected from the high-end audio product sound wise. On the good, inspiring side, there are quite few great products out there, that ring the bell and light up green sensory switches with their great performance, features and prices that seriously rivals the giants and Gold Note PH-10 is one of such stand out examples. 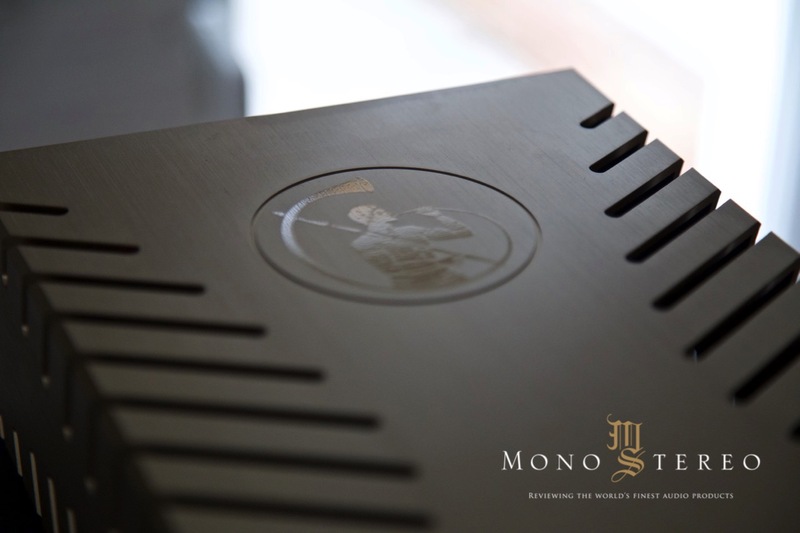 Maurizio Aterini and his team are pushing things audio with his high-end audio venture for over twenty years. 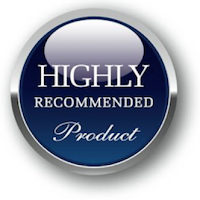 Many interesting products were designed and developed over the years. Some more common and quite few exotic ones, that explored more esoteric side of ultra high-end audio. I’m considering my self lucky as I’ve could listen to the few of them back in time. They were not exotic just for the sake of it, but have expanded above typical sound possibilities in a grand way. 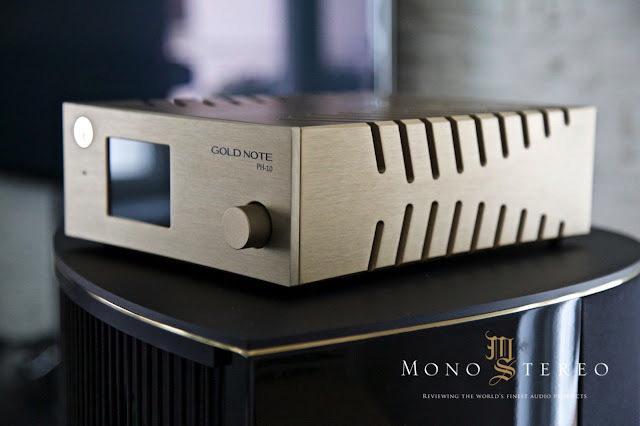 PH-10 is the first generation of the new era of electronics launched by Gold Note. It incorporates TFT monitor and the Single Knob Control (SKC), that allows easy managing of the unit’s function with a single joggle. Most importantly, all the controlled function are not implemented via DSP micro controller, but with actual real high quality analogue heart. Everything is super easy to handle with via user friendly interface, without any annoying sub menu diving. 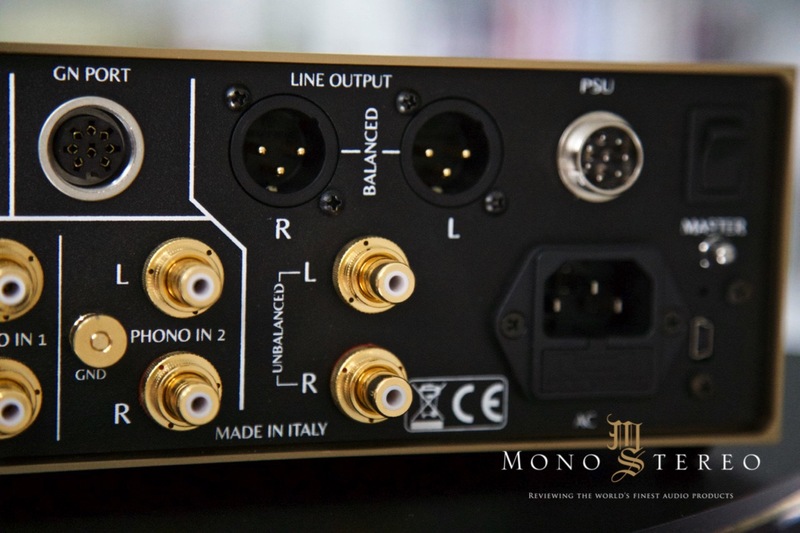 PH-10 is among first phono preamplifiers with a USB port, that allows software/firmware updates via simple insertion of the SD card where software is stored. The upgrade can be made “on the fly” without even unplugging power chord. 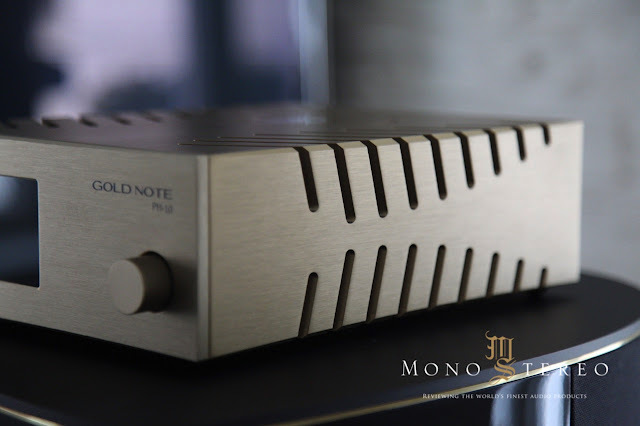 Gold Note PH-10 it is also the first phono decently priced preamplifier, that allows a real full control of two arms/cartridges, that can be either MM or MC, both with wide variability of set up like gain, impedance and even equalization curves. Last but not least, PH10 feature very own, non magnetic material chasing. Massive block of cut machined aluminum forms a single piece chassis, that control both vibration and electromagnetic fields in the best way. But, thats not all. There is also optional wifi App coming, that will let you control all the setting from your phone or a tablet. PH-10 shows all the available features on its 2,8” color display. 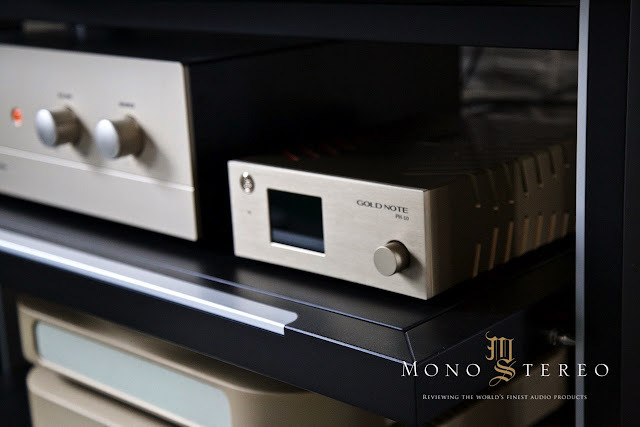 As described above, all the function are reachable via Gold Note’s proprietary SKC - Single Knob Control technology. This intuitive control system was developed for easy browsing and usage of the unit's functions. 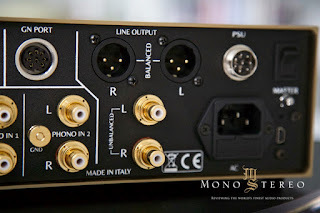 Two separate RCA inputs let you independently connect two different tonearms and further fine settings allows great match close to the cartridge specification. PH-10 offers four different GAIN levels [-3dB, 0dB, +3dB, 6dB], that helps reaching optimal output level of any MM or MC cartridge. Next step is fine matching of the exact load. PH-10 allows 10Ω, 22Ω, 47Ω, 100Ω, 220Ω, 470Ω, 1000Ω, 22KΩ, 47KΩ settings, that will help with close match of the cartridge. Nice graphics with subtle Gold Note logo in the background shows the selected curve on the front display. Everyhing is tactical and straightforward. But, thats not all. 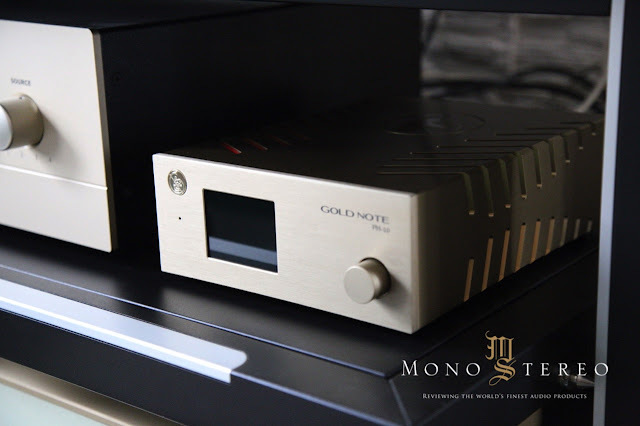 All three curves also have an optional, enhanced version, that implements Gold Note proprietary design, and adds updated dynamics/resolution. Upcoming external expansions offers a dedicated inductive dual-mono power supply, Curve Equalizer Extender unit, Class-A Tube Output Stage and Gain Stage Enhancer. PH-10 USB port on the back panel is also allowing quickly future software updates. A Milstein Recital belongs to the dozen of my recent, rare and beloved vinyl findings. As much as I love to digest newer recording of classical music, there is always something special and different about the rare black disc gems of the past. I guess it comes down to the “simplified” recording techniques and stand out performers. Anyhow, I’m uberly enjoying such records and this particular Nathan Milstein record partnered with Gold Note PH-10 exhibited surprisingly sparkling and vivacious sonic composition. It instantly introduced a grand connection with midcingulate cortex and the anterior insula instead of pursuing Lateralization of left brain functional behavior. From saltato to staccato PH-10 handled attacks, sudden notes shifts, note overlaying and harmonic structure with ease and authority, without introducing the mechanical phenomena. The way it could render tempestuous swings and reveal depth in music dangerously pointed toward the five digit phono preamplifiers. That tells a lot! PH-10 behaved far away from stridently detailed nature. 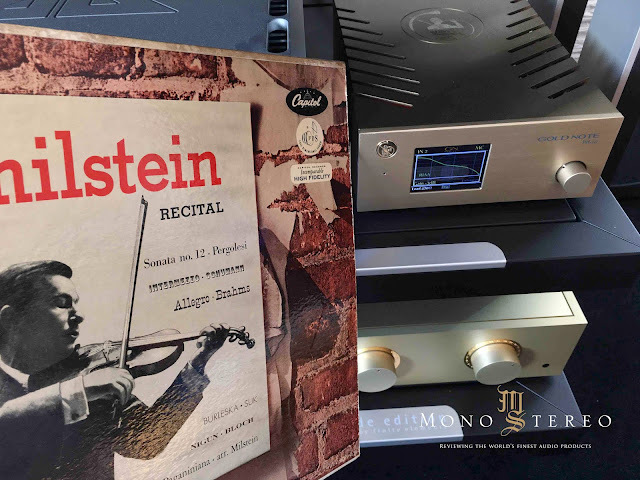 It rather projected expanded and balanced details, that offered the abundance of acoustical cues, that forms an involving and captivating analog experience. 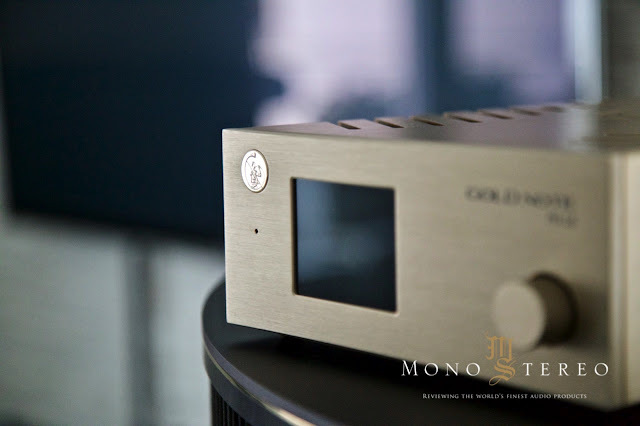 Gold Note PH-10 phono preamplifier is as straightforward as it gets. No dip switches, no reaching at the back panel or removing top lids for fine adjustments. Operation is as simple and elegant as it gets. I’ve asked Maurizio Aterini about possible future additions of the different EQ curves and he ensured me that its possible (and planned) to implement even more of them. Considering how many optional curves are out there it would be fantastic to have even more of them onboard, but even with the ones on board you can instantly dive into the endless analog universe. 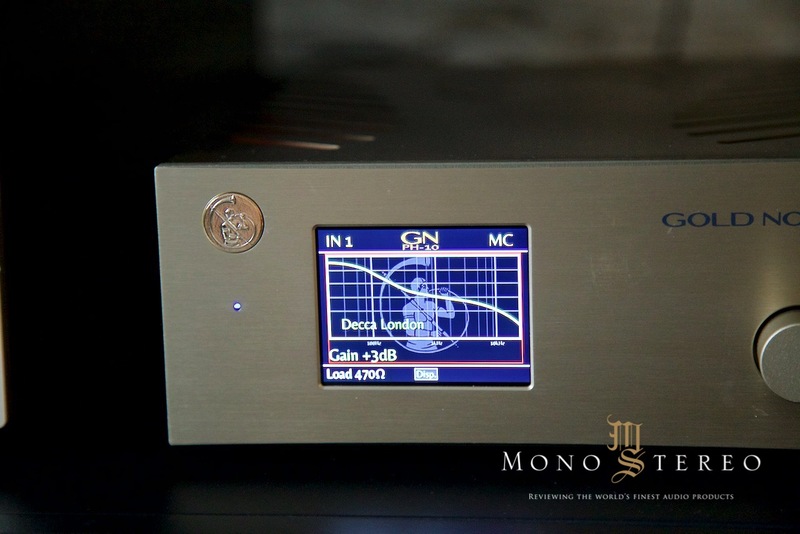 I’ve been asked to often, what phono preamplifier should I recommend at the down to earth pricing. 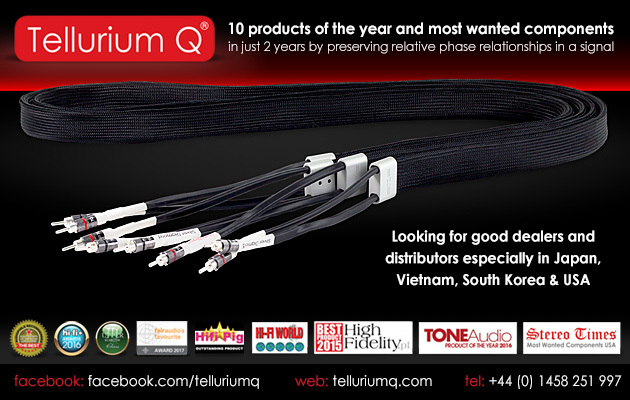 At the moment, there is simply nothing similar with such sound, easy upgradability and expandability. Having such adjustability and sonic performance at this price level is not only inspiring, but encouraging. If you think about optional remote app and possible future software upgrades, PH-10 becomes even more of a gem. 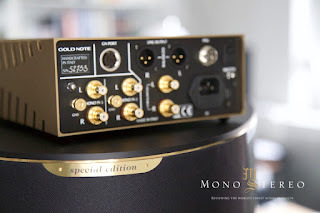 Gold Note PH10 won me over with both features and sound. Anyone getting into the vinyl reproduction, thinking of returning or comes with the mileage should closely consider this stand out analog box. PH-10 is not only packed with features, expandable and future upgradable. It sounds great, involving, brings potent dynamics, sense of three dimensionality and so called balanced transparency, that is not even scenting towards the brittle realms. This is a mighty, emotionally engaging musical box, that even without all the expandable accessories brings more then expected. A thrill and a fill! 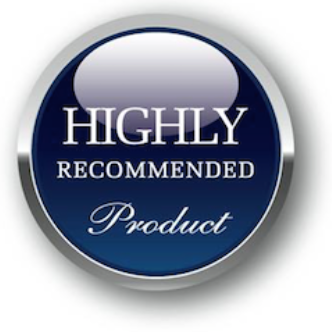 Maurizio Atterini and his team did strenuous work with PH-10. 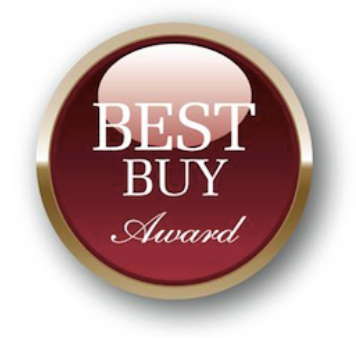 Its a Gold Note land mark product, that I’m more then sure bring a lot of happy customers. Even before adding next review installment I’m wholeheartedly giving out both Mono and Stereo Highly Recommended and Best Buy Award at once. 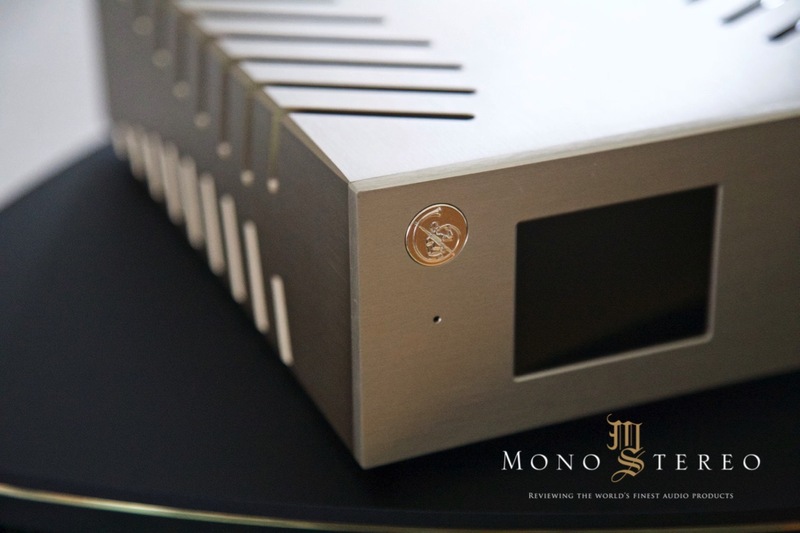 This is the first phono preamplifier, regardless of the price that have scored both of them.